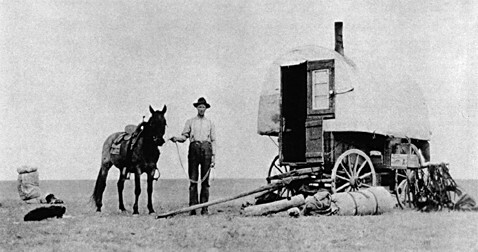 While researching Gypsy Caravans, I came to the sheepherder wagon or sheepcamp, as it's known in this part of the West. This home on wheels was the predecessor of the modern day camper. It was used by sheepherders as they tended and continually moved their grazing sheep to pasture at higher elevations. They followed the spring to avoid summer temperatures, reversing the process in the fall. The easily moved and self-contained home on wheels was the embodiment of efficiency and practicality. Containing a bed, stove, table and storage space, the sheepcamp was developed in Wyoming during the 1880's.